Scissor lifts (low-rise…mid-rise…full rise) lower all the way to the ground when in the “stored” or “ready position”. The cylinders (when the lift is in the fully lowered position) are “horizontal”. When the operator starts the lifting process, pressurized hydraulic oil is forced into the cylinders from the electric power unit/gear pump. The pistons’ initial movement is along the horizontal plane. As more pressure is applied, the cylinders begins to move into a slight vertical position and the extended pistons begin to exert force in a vertical (up) direction rather than a horizontal direction. Lifting capacity is increased as the cylinders/pistons achieve a greater vertical angle. There is probably some scientific formula that uses ambient temperature, amps, voltage, oil viscosity, piston size, vehicle length and about a dozen other variables to determine the exact minimum vertical cylinder/piston angle needed to achieve maximum lifting capacity. Instead of utilizing a formula, let’s use some common sense. The distance between the lifting surface of the lift and the lifting points of the vehicle will determine the vertical angle of the cylinder/piston. The greater the distance between the two contact points will increase the vertical angle of the cylinder/piston. 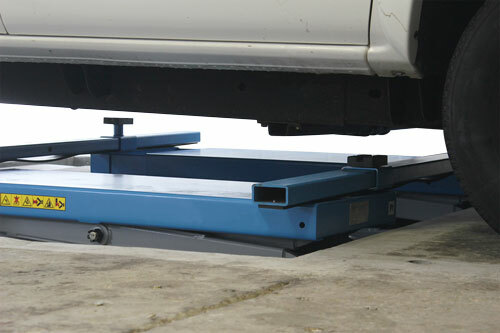 If you own a 6,000 lb lift and are lifting a 3,000 lb vehicle and have the correct electric voltage and amperage, you might be able to have the lift in the fully lowered position and place the lifting pads or blocks directly against the vehicle’s lifting points (no gap between lift and contact surfaces) and still raise the 3,000 lbs. car. However, in the fully lowered position, the cylinders (and pistons) are lying horizontally and may not be able to exert the needed “vertical” pressure to lift the full 6,000 lbs. rated capacity…but (perhaps) they could lift 3,000 lbs. If you attempt the same scenario (no gap) with a 5,500 lb. car, the lift may not be able to raise the vehicle because the horizontal (positioned) cylinders need to achieve a slight vertical angle before they can develop enough “upward pressure” to lift this heavier car. Since there is “no gap” between the lift and vehicle’s contact points…the vehicle’s 5,500 lbs. weight will prevent the cylinders from “moving to more vertical position” and the car may not move. The “higher” the lift can be raised from its fully lowered position (cylinders in a more vertical position) BEFORE it contacts the vehicle’s lifting points, will result in greater lifting capacity. Remember that a scissor lift (normally) has a smaller lifting “surface” (top pads) than a four post or two post lift. The (shorter) distance (front to back) between the scissor pad’s lifting points require that the operator makes sure that proper vehicle weight distribution is achieved. The vehicle weight distribution (balance) is much more critical on a scissor lift than on a two post or four post lift. A two post lift has vertical cylinders that deliver maximum lifting capacity from the moment that the operator presses the power unit button. You can raise a 10,000 lbs. vehicle with a 10,000 lbs. rated lift (with the pad adapters in contact with the vehicle’s lifting points) BECAUSE the cylinders/pistons are in a complete vertical position and maximum lifting capacity is achieved almost immediately. A four post lift (with a horizontal cylinder and cable lifting system) delivers maximum lifting capacity with the vehicle sitting on the runways, because the cable/pulley system is not “activated” until the horizontal cylinder is allowed to build maximum hydraulic pressure…(which is almost immediately)…and then the cables are “moved” by the extended horizontal piston and full lifting capacity is achieved. The scissor lift (with horizontal cylinders in the “down position) must have a “gap” between the lift and vehicle’s lift points to allow the horizontal cylinders to move upward (slightly vertical) to increase their vertical lifting capacity. If you own a 6,000 lb. mid rise lift and it will not lift your 5,500 lb. vehicle…and you have the correct amps/volts…and the vehicle is properly balanced on the lift, then you need to increase the distance between the vehicle’s lifting points and the lifting surface of your mid rise lift. If you are lifting a “low-rise” heavy vehicle, consider driving the vehicle “up” on a pair of 2 x 10 boards to increase the distance between the car and the lift. Continued “failed” attempts to lift heavy vehicles without the proper “gap” between lifting surfaces will normally result in gear pump and electric motor damage. Common sense works…use it.